Spin Around The World With Karianne: I fear No Beer! He is a father figure to you and will make sure you don't get trapped into drinking again. Your where ignorant last time, but now your eyes are open and you will not let them pressure you into sin again." Så jepp, nå har jeg snille gode Larry til å passe på meg neste gang. 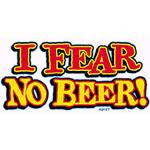 I Fear No Beer!